The plan to create clean energy to last 120 years via a tidal lagoon in Swansea has sparked an environmental row in Cornwall. A proposition to reopen a quarry near St Kevergne, Cornwall, in order to source over 3m tonnes of stone needed for the construction of the lagoon has been met by strong opposition. 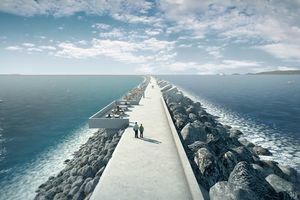 The stone would be used to create a six mile breakwater in Swansea in the hope of generating shipping traffic through a newly created marine conservation zone. The quarry project in Cornwall has already created friction from the local MPs and groups of ocean scientists who oppose the scheme. A campaign has been set up by Gabriel Yvon-Durocher – a senior lecturer in natural environment at the University of Exeter – named ‘Cornwall Against Dean Super Quarry’. The campaign aims to save the ‘marine national asset’ that would be destroyed by the proposed works. A statement from the Marine Conservation Zone page states: “We are outraged that a company plans to desecrate the Manacles Marine Conservation Zone within 2 years of it being established.” The conservation zone protects the ‘diversity of nationally rare, threatened and representative habitats and species.’ Construction of the Cornwall breakwater and tidal lagoon in Swansea has the potential to completely destroy the Marine Conservation Zone.